Failure to adequately manage Bed Bug outbreaks has led to the release of a national code of practice to improve pest management. There is a call out for better education and due diligence amongst the community for regular inspection, prevention and treatment of Bed Bug outbreaks. Whilst there is no evidence to show that Bed Bugs transmit infectious disease, life threatening anaphylaxis may occur in a minority of cases where people show signs of severe allergy. Skin rashes and interrupted sleep patterns are a frequent complaint. Bed Bugs are rust brown in colour and turn a deeper red brown after a blood meal. They pierce the skin and inject a blood thinner to bleed and feed from their human host. Whilst humans are their favourite meal, they can also feed from pets. They can not hop or fly but crawl everywhere and hitchhike rides on clothing, bags, luggage… They feed once a week and the female lays 5 – 10 eggs immediately after. They are difficult to find during the day. Bed Bugs have a flat shaped body which allows them to hide away in dark cracks and crevices. Take time to carefully look for dark lines in the crevices of furniture, bedding, drawers and clothing. Bed Bugs stick close to each other and typical mattress infestations reveal blood spotting. Skin reactions are common and most notable around the arms and shoulders. Raised and reddened skin around the bite extends to approximately 2cm in diameter and often follows with itchiness. Professional pest controllers are trained to uncover and identify areas of Bed Bug infestation. They are licensed to administer an approved insecticide. It is recommended that areas of infestation be vacuumed and steam cleaners can also be used. Clothing and bedding should be washed on a hot cyle and dried in a clothes drier. In areas of heavy infestation, unfortunately complete control is difficult in the first treatment. 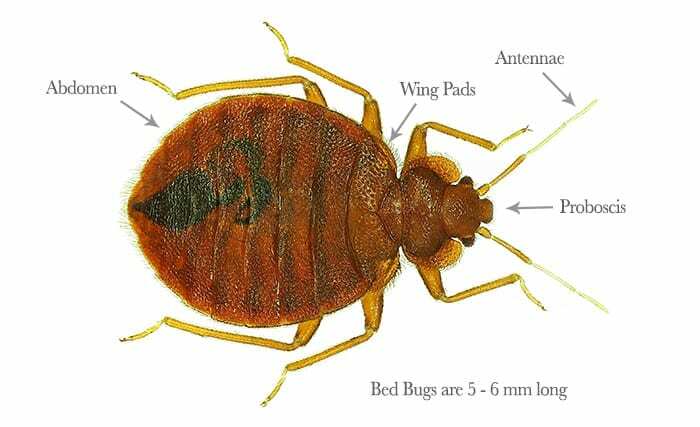 The area should be closely monitored and the licensed Pest Controller may need to return to eradicate the Bed Bug pest.